Peter Kaberia, the Sports Principal Secretary has assured that renovation works at the four stadia that had been earmarked to host next year’s African Nations Championship (CHAN) will go on as planned despite CAF stripping Kenya of the hosting rights. On Thursday last week, the cabinet approved a Sh4.2bn budget towards the rehabilitation of stadia and preparation for the tourney. But, two days later, CAF stripped Kenya of the rights due to the slow rate of construction and the current political situation, a re-run of the presidential election. On Monday afternoon the PS assured that the money will not be returned to national coffers. “The government has committed resources and we will continue with construction as planned with or without CHAN. The commitment to build these stadia is on, money has been given, contracts signed and works ongoing,” Kaberia announced. Kaberia had a tough time explaining why the process of approving budgets and handing out contracts had to be done almost three years after the bid was handed out. He admitted that work should have started earlier, but was also quick to note the miss might be a ‘blessing in disguise’ as the country might now get an opportunity to put its sporting infrastructure in order. Kaberia’s boss at the ministry, Cabinet Secretary Hassan Wario has been missing from the scenario. He has been off CHAN issues and even failed to meet with the CAF delegation when it visited for the final inspection two weeks ago. The PS declined to apportion blame to anyone in the ministry maintaining that ‘people at the ministry’ worked very hard to ensure that CHAN came home. Wario was in the company of former FKF boss Sam Nyamweya when they were officially handed over the mantle in Kigali Rwanda. He is on record as promising that the government was fully committed, even going further to promise two new stadia would be built for the Championship. Nyamweya has asked his successor to resign alleging he has failed to give leadership on the CHAN debacle. “It is now time to bite the bullet. Time has come for those who have denied the country this great opportunity to go. Kenya should now start a fresh process of getting a leadership in football that can take us to another level and it is not the current regime,” Nyamweya said in a statement. He went on to accuse Mwendwa of failing to push the government enough despite his advise on the strict timelines of the event he helped bid for in 2014. Meanwhile, Mwendwa has reiterated that he will not resign despite being on record as saying he would throw in the towel if Kenya failed to host CHAN. “I was very clear when I said that I would only resign if it was the federation’s mistake that cost us the chance to host CHAN. I am saying it again, I will not resign,” a defiant Mwendwa said. 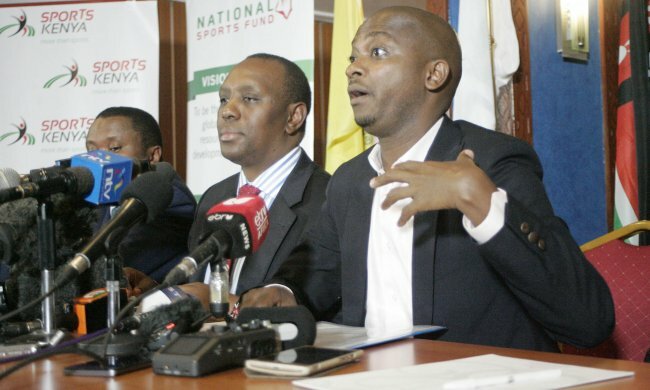 Mwendwa and Kaberia have stuck to a common narrative that biggest on CAF’s list of reasons as to why the tournament would not come to Kenya was the political situation. But, sources intimate that CAF was not comfortable with assurances from both CAF and FKF that venues would be ready in time. “We told them that we would be ready, but they chose to say that they thought we would be ready. I made a presentation and the PS also made a presentation but at the end of the day they had to make a decision,” Mwendwa said. The FKF boss has now said that Ahmad Ahmad, the CAF president promised to support Kenya’s bid to host one of the 2019 FIFA junior World Cups. The bid window for this tournament has been closed SNA established. He explained that although the bid window was closed, FIFA is discussing some changes to the tournament which might see fresh bidding done. He did not provide proof for his allegations. “The requirements for junior tournaments are more or less like CHAN and we know that once these stadia are completed, we can present a very powerful bid to FIFA and get approved with the backing of CAF. That is what we are exploring and we intend to put the bid in February,” Mwendwa said. His sentiments were echoed by Kaberia who said he would personally drive forward the construction works to ensure they are ready by the same timelines they had given contractors for CHAN. “Kenya has all things going for us. We could host any event here and we could get the support only part incomplete is the stadia. We are committed, we will continue working to even qualify for bigger and better events, we will develop more stadia in future,” Kaberia said. Meanwhile, Kenyan football stakeholders continue to count the losses after the decision by CAF. Stanley Okumbi, the Harambee Stars coach was saddened with the news especially as the team protracted to play CHAN had already engaged in four friendly matches including a week-long camp in Morocco. “It is a big loss for the players because this was an opportunity to show that we have a strong league. As a coach I am disappointed because this is a massive opportunity gone for us,” Okumbi noted. His sentiments were echoed by Gor Mahia skipper Musa Mohamed who said; “It is a big loss for players and fans. We would have seen and played against the best of Africa, but the chance is gone.” It is not only players and officials who have been distraught by the decision but football fans as well. Meanwhile, CAF is expected in the next two weeks to announce a new host for the Championship. Ghana and Ethiopia (hosts of 2020 CHAN) have been touted as possible replacements with Morocco and South Africa also said to be interested.